Everyone knows that dogs don’t do ballet, except for one little girl in Miss Polly’s ballet class. This little girl has a sneaking suspicion that her dog is actually a prima ballerina. Biff just isn’t interested in fetching a stick because he is too busy staring longingly at her tutu. It all comes to a head one day when Biff attempts to sneak into Miss Polly’s ballet class and faces a humiliating dismissal. After that Biff won’t even eat his doggie-donuts and retreats to his kennel to howl at the moon. 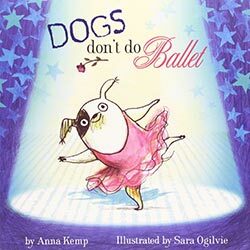 A catastrophe at the Royal Ballet gives Biff the chance to truly shine and to prove that perhaps dogs do, do ballet after all! This hilarious and beautifully illustrated book will have young readers giggling time and time again.